Hunting for a literature elective to add to your child's Language Arts courses? Look no further. 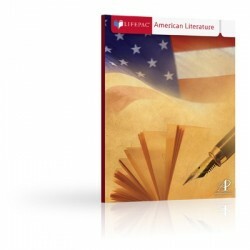 Alpha Omega Publications has just what you needthe LIFEPAC American Literature elective for 7th-12th grade. This fun-filled, consumable literature course has interesting lessons filled with full-color illustrations and easy-to-follow directions. With this encouraging course, your student will love learning classical American Literature! Plus, LIFEPAC features many helpful tools like integrated subject material, personalized instruction options, and solid reviews to build concept mastery. What could be better? This one-semester course is divided into five unit worktexts and includes modern American poetry from authors like E.E. Cummings, Robert Frost, W. H. Auden, and Carl Sandburg. But wait, you havent even heard the best part. LIFEPAC has a time-saving teacher's guide to make homeschooling parents' lives easierand it includes teaching tips, clear objectives, and ideas for additional activities. Plus, you can be assured your child will learn quality, Bible-based academics. What could be better? Order the LIFEPAC American Literature elective for 7th-12th grade and see how fun literature can be! A required reader, Our Town, is sold separately.